"I wouldn't get too attached to that boy…" An official international trailer has debuted for an indie film titled Mean Dreams, which premiered at the Cannes Film Festival last year (in the Directors' Fortnight sidebar) and also played at the Deauville Film Festival and TIFF. The stylish romantic thriller is about Casey and Jonas, two teens desperate to escape their broken and abusive homes after falling in love. This stars Sophie Nélisse as Casey and Josh Wiggins (from Hellion, Max) as Jonas, along with Bill Paxton and Colm Feore. I caught this film at Cannes last year and it's solid, an enjoyable and thrilling story about young lovers. The lead performances are outstanding, making the film better than it really is. Worth a look. 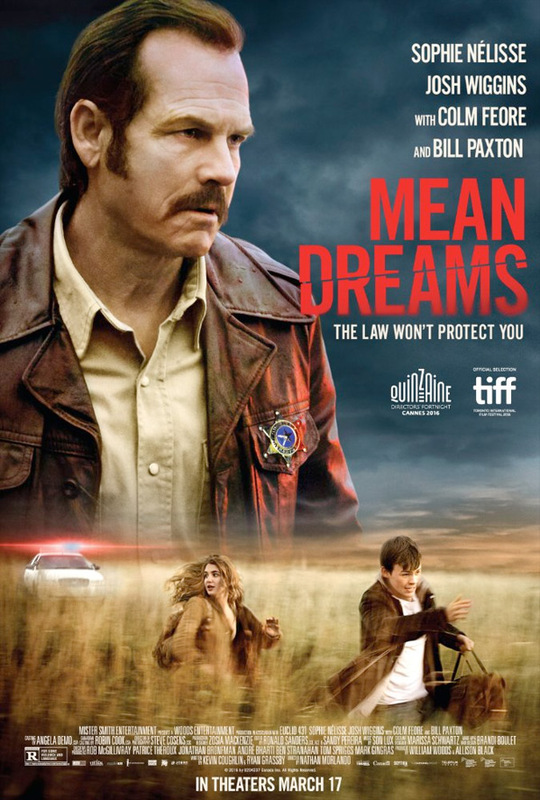 Mean Dreams is a thriller about a fifteen-year-old boy who steals a bag of drug money and runs away with the girl he loves while her corrupt cop father hunts them down. This coming-of-age fable brings together the desperation of life on the run and the beauty and wonder of first love. Mean Dreams is directed by American filmmaker Nathan Morlando, his second feature film after making Citizen Gangster previously. The screenplay is written by Kevin Coughlin and Ryan Grassby. This first premiered in Directors' Fortnight at the 2016 Cannes Film Festival last year. Mean Dreams already opened in Canada and France, and lands in Singapore next this April. Vertical Ent. will release Mean Dreams on March 17th. Thoughts?